Five more records were added to the discography this week. 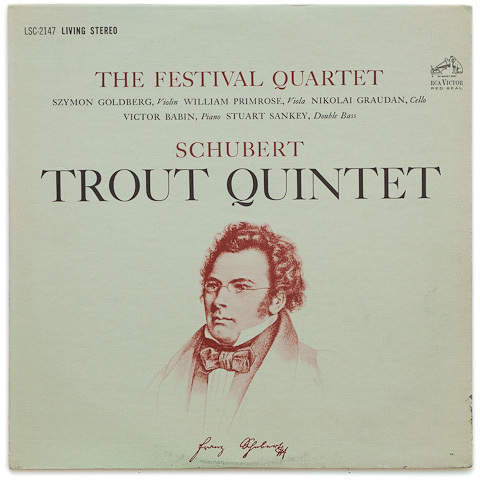 They include rare titles such as Schubert’s Trout Quintet by the Festival Quartet, and Ballet Music from the Opera from Fistoulari/PCO. Also added was a gatefold copy of Spain by Reiner/CSO, a Goodwill-provided Schubert’s Death and the Maiden by the Juilliard String Quartet, and Virtuoso Favorites by Erick Friedman. Exciting! Not much further to go until we have all the titles in the 1806-2799 series covered. If you know of anyone with an extra copy of the Faust/Carmen, Witches Brew, or Liliane Garnier Recital records sitting around, please let me know :). Today I added 10 more records to the discography. These include several multi-record sets as well as a few from the single series. The multi-record discography page is still looking a little bare, but the single record pages are really starting to fill in. With luck, we’ll have another dozen or so to add in the coming week or two. As I mentioned before, soon I’ll be adding photos of inserts for records that have them. Also stay tuned for other exciting improvements and additions planned for 2012. Lots to look forward to! Some alternative covers were also added for records released with more than one. Thanks to Chris Hite of Clarion Records for letting me photograph so many fine records from his collection. There are now only a handful of record pages not included in the single-record section of the discography. Look for most of these to be added in the coming weeks. We will also be adding many missing photos of labels and inserts. Exciting! 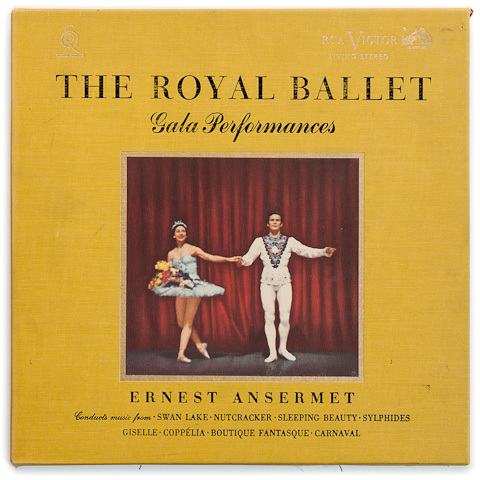 The multi-record sets were added to the discography today, including the praised and rare LDS-6065 – The Royal Ballet — Ansermet. Check out the new Discography (LSC-6052 to LSC-9300) page. This page will have a lot added to it in coming weeks and months. There will also be a large number of gaps filled in the single-record series very soon. Exciting! By the way, I’ve heard from many visitors during 2011. They say this site is a valuable resource. In 2012, I intend to make it even more valuable. In addition to high quality photos, this site will include detailed information about each record, including things like release date and mono equivalent. See details on the About page. The rare and expensive LDS 6065 — The Royal Ballet, Gala Performances conducted by Ernest Ansermet — is considered by many to be the most desirable title in the Living Stereo series, and it will be coming soon to this website. Thanks to the generous Scott Campbell of Scott Campbell LPs, I was able to photograph this exceptional 2LP set in all its glory. Below is a shot of the clothbound slipcase. I’ll be adding the rest of the shots, as well as a new section devoted to the multi record sets, in coming days. Enjoy! The second half of the LSC-26XX set was added today. See the goodness on the Discography (LSC-2600 to LSC-2699) page. This set includes a couple of records with odd prefixes, the first of which is the famous VCS-2659 – The Power Of The Orchestra ~ Royal Philharmonic • Leibowitz. My copy of this one has some mean ring wear on the cover, but the sound is quite gorgeous. The other oddball is SPS-33-190 – The Power Of The Organ ~ Robert Owen, which was apparently released as a companion to VCS-2659 but bears a different prefix. Perhaps someone knows why this was the case? The first half of the records in the LSC-26XX set were added today. All have dedicated pages with high quality photos of front covers, back covers, and labels. Check out the Discography (LSC-2600 to LSC-2699) page to see the new record pages. A couple stragglers were back-filled as well. LSC-2298 and LDS-2560 are now represented. Stay tuned for more! The other half of the records in the LSC-25XX set are now up. Each has a dedicated page with high quality photos of front covers, back covers, and labels. Check out the Discography (LSC-2500 to LSC-2599) page to see the new record pages. Next up: the LSC-26XX series. I’ll post again as soon as the next batch is added. Roughly half of the records in the LSC-25XX set now have dedicated pages with high quality photos of front covers, back covers, and labels. See the Discography (LSC-2500 to LSC-2599) page for the goods. The second half of the set will be posted soon. Meantime, check out the interesting discussion about shrink wrap going on in the forum. Today, the vast majority of the records in the LSC-24XX series were added to the discography. Lots of great titles in this set — too many to list. Check out the photos and add your comments to any record page. Also, please check out the about page to see how the discography will evolve over time. So much to look forward to!